V.B. stands for (California) Vinegar Bitters. An article in an 1886 issue of the Pharmaceutical Review listed four products: Vinegar Bitters Cordial, Vinegar Bitters Powders, Vinegar Bitters,new style (pleasant taste) and Vinegar Bitters, old style (bitter taste). These four products were called the “Big Four” in an 1886 advertisement. He fell in with an enterprising druggist, who saw money in the project and joined him. At the suggestion of the latter, the “Indian” was struck out, and as the concoction got sour by fermentation, it was concluded to call it “Vinegar Bitters,” and to identify it with the temperance movement. The native herbs which became rather troublesome to collect, were discarded and aloes, being a cheap bitter, was substituted. “Nine sick people out of ten,” said the druggist, “will be cured by purging.” Wherefore the aloes and Glauber’s salt. So the cook turned doctor, the decoction became sour and of Californian instead of Indian paternity, and “Doctor Walker’s Vinegar Bitters” began their career in the newspapers, on fences and rocks, and on the shelves of the drug stores. 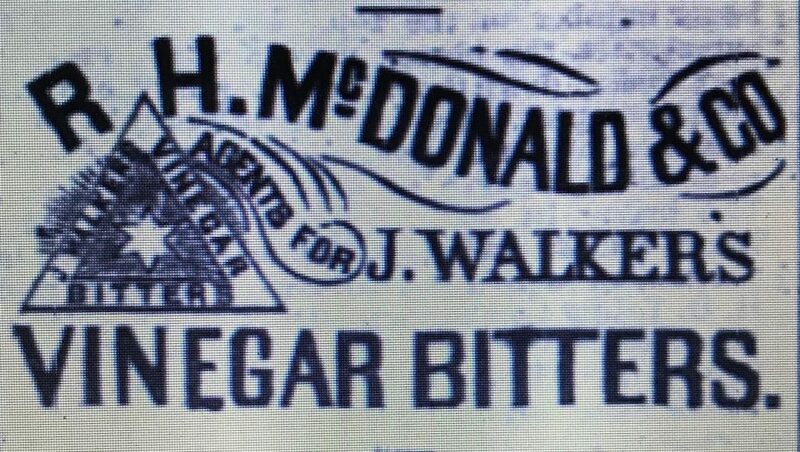 Whether J. Walker was the cook, a fictional character or more likely a little of both is not clear but early advertisements for his vinegar bitters listed him as: “Joseph Walker, Proprietor, Corner Post and Powell Streets, San Francisco.” The druggist in the story was most likely Richard H. McDonald. Advertisements, which first appeared in the 1868 editions of several California newspapers listed wholesale druggist, R.H. McDonald & Co., as the agent for Walker’s Bitters. The principals of the firm were Richard H McDonald and John Campbell Spencer. McDonald, in addition to being a druggist and businessman, was also the president of the Pacific Bank in San Francisco. In the early J. Walkers advertisements, R.H. McDonald listed San Francisco (corner of Pine and Sansome Streets), Sacramento and New York as their locations. 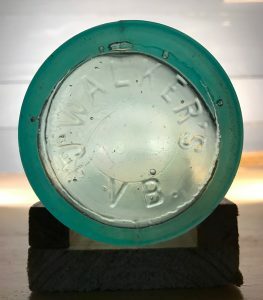 The business of R..H. McDonald and J. Walker’s Vinegar Bitters remained closely associated from 1867 until the early 1890’s, so much so that they were almost certainly one and the same. a purgative and tonic, purifies the blood, strengthens the liver and kidneys and will restore health, however lost. is the great disease preventer, and stands at the head of all family remedies. No house should ever be without it. cures Malarial, Bilious and other fevers, diseases of the Heart, Liver and Kidneys, and a hundred other painful disorders. The advertisement went on to tout their sales and marketing information that they referred to as reference books. Send for either of our valuable reference books for ladies, for farmers, for merchants, our Medical Treatise on Diseases, or our Catechism on Intemperance and Tobacco, which last should be in the hands of every child and youth in the country. Each bottle contains 19 to 20 fluid ounces, consisting of a decoction of aloes and a small quantity of gum guaiac, auiseseed and sassafras bark, in water slightly acidulated with acetic acid, or by subsequent fermentation, or by the use or addition of sour cider; to this are added about one ounce of sulphate of soda, 1/4 ounce of gum arabic and 1/2 to 1 fluid ounce of alcohol. 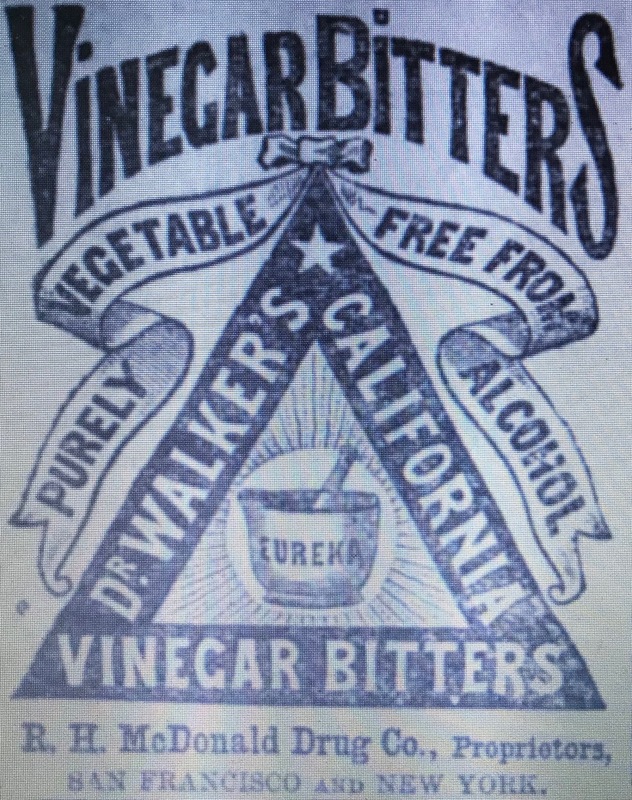 Despite the presence of alcohol, part of the Walker’s marketing strategy was to associate it with the temperance movement calling it the “Only Temperance Bitters Known” They even went so far as to include the phrase “free from alcohol” on their logo. This fact wasn’t lost on the author of the Pharmaceutical Review article who summed it up this way. For the latter ones (Vinegar Bitters, old and new styles) they still cling to the temperance cause. Their pamphlets and circulars, therefore, are crowded with mottos and sentiments of that kind, and their perusal is quite a humorous treat, and may be beneficial without taking the medicine for those, who are inclined to a bilious temperment. “The Catechism on the Twin Evils Intemperance and Tobacco” (one of their advertising Pamphlets) is worth a perusal and cannot fail to incite the most obstinate hypochonder to a hearty, healthy laughter. …The death of Dr. McDonald recalls the sensational incidents surrounding the failure of the Pacific Bank (in San Francisco)and the People’s Home Savings Bank in this city in 1893. The crash of these two concerns and the resulting disclosures of wholesale fraud involving Dr. McDonald, his two sons Richard H. McDonald Jr. and Frank McDonald, and other men high in financial and political circles of the community formed the most startling sensation in the history of finance on the coast. On June 22, 1893, the Pacific Bank suspended payment and on November 3 it was declared insolvent. A terrific run immediately commenced on the People’s Home Savings Bank, and it also soon went under, carrying ruin to hundreds of poor depositors. President McDonald and R.H. McDonald Jr. were indicted by the grand jury and made to stand trial. Frank McDonald fled to Japan. In both instances the alleged offenders were released upon technical grounds after sensational trials. Dr. McDonald, who was considered more the unfortunate dupe of his two sons than an active offender, could not face the shame of the sensational incident and left the city for Cuba, never to set foot on his native land again. Today, in New York City, neither the Platt Street or Washington Street locations date back to the business. 32 Commerce Street now appears to be part of the footprint of 72 Bedford Street but the adjacent building at 28 Commerce Street looks like it dates back to the time frame of the business. The shape of the bottle I found matches the shape of a labeled bottle found on the Internet. It also agrees with the 19 to 20 ounce size mentioned in the contents description above. It probably dates to the late 1800’s.